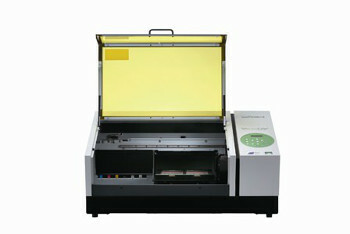 Potential of the VersaUV LEF-12 desktop UV-inkjet printer from Roland DG a winner. VersaUV LEF-12Instead of battening down the hatches and weathering recent economic storms, UK based ALD Print has fought back by diversifying its print business with the recession-busting VersaUV LEF-12 desktop UV-inkjet printer from Roland DG. Established as a graphic design company in Sheffield 22 years ago, ALD responded to the recession in the 90s by expanding into commercial print and digital sign printing, having spotted that people were making healthy returns. Further growth since then has seen ALD evolve into a comprehensive print supplier, with screen, four-colour litho and digital technology all in house. Litho remains ALD Print’s core business, but as pro-activity had served owner Alistair Lofthouse well in previous periods of financial pressure he recently began exploring new markets and technology and instantly recognised the potential of the VersaUV LEF-12. “Finding new markets have been essential for us because it’s a difficult time for commercial printers and with the VersaUV LEF-12 we are now personalising pens, USBs, even restaurant menus on wood and much more, for new and existing customers. 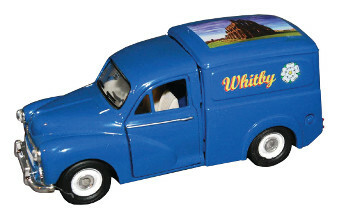 Recently we printed a range of die cast model cars for a motoring heritage museum and expect this to be repeat business, while the same customer now buys printed rubbers, rulers and pencils for the gift shop from us,” said Alistair. The VersaUV LEF-12 printer is designed to bring lucrative customisation and personalisation opportunities within reach of businesses of all sizes. As straightforward to use as an ordinary desktop printer, it’s an extraordinary machine that can print logos, images and text direct to a huge range of materials and objects up to 100mm deep, including wood, card, papers, films, glass, polyesters, metal, leather and plastics. ALD print onto model carsThe on-demand nature of inkjet printing and the non-existent set-up costs have been critical to establishing ALD in its new markets and building trust with its customers. “There are no set up costs so a sample will cost the customer nothing. We can immediately prove to customers exactly what we can do - and they always come back,” said Alistair. ALD Print’s customer base is broad, including businesses of all sizes and types requiring everything from labels to marketing collateral, and it has been able to upsell work on the VersaUV LEF-12 in many cases. But a welcome surprise for Alistair has been the amount of new customers brought to the business by the VersaUV LEF-12, that have also become customers for his more established print services. Alistair Lofthouse Owner ALD and Liz Mottram co-director with the VersaUV LEF-12 from Roland DG Being heavily experienced in the art of litho and screen printing, the learning curve associated with adopting UV-inkjet did not present a problem thanks to Roland’s proprietary RIP software, VersaWorks. “We explored competitor solutions but found their software complex and cumbersome compared to VersaWorks, which is powerful yet intuitive and simple to use. We also felt that in terms of colour the solution we chose needed to be able to achieve consistency with our traditional printed product lines and the VersaUV LEF-12 stood out in this respect too. “We bought the machine through Grafityp, a Roland Authorised Dealer, and the installation was straightforward and the induction training provided was good – we were up and running in a day and a short while afterwards an engineer returned to help optimise ink usage with a software upgrade free of charge. ALD Print also used the VersaUV LEF-12 to catch the eye of the judges for the BPIF Excellence Awards by printing its entry for the Innovation award onto foam board 3mm deep, resulting in a nomination for its diverse range of printed items. or call 0044 (0) 845 230 9060 to arrange a personal demonstration at one of its regional showrooms.